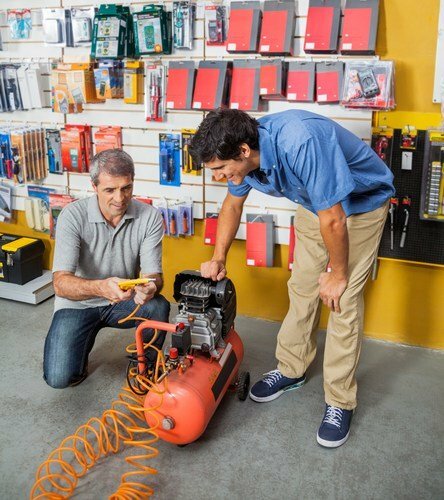 One question that seems to get asked all the time when it comes to using air tools is “how large of an air compressor do I need”? 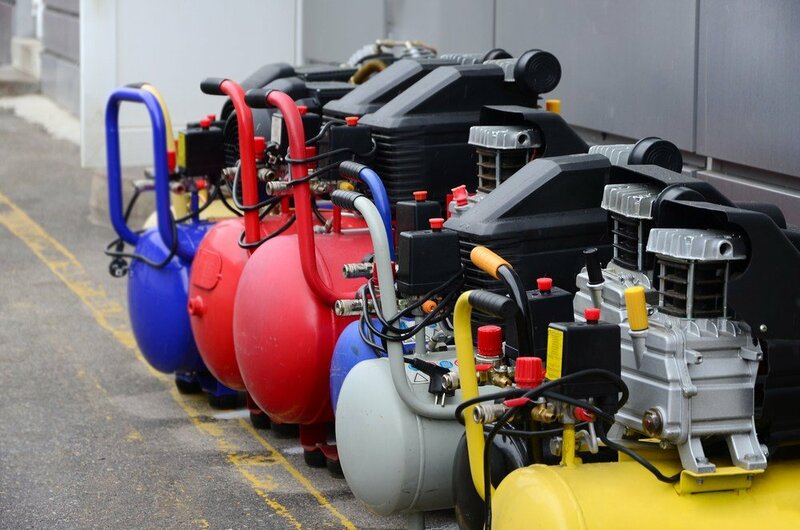 Manufacturers make a large range of compressors, from small portable air compressors to large stationary air compressors. 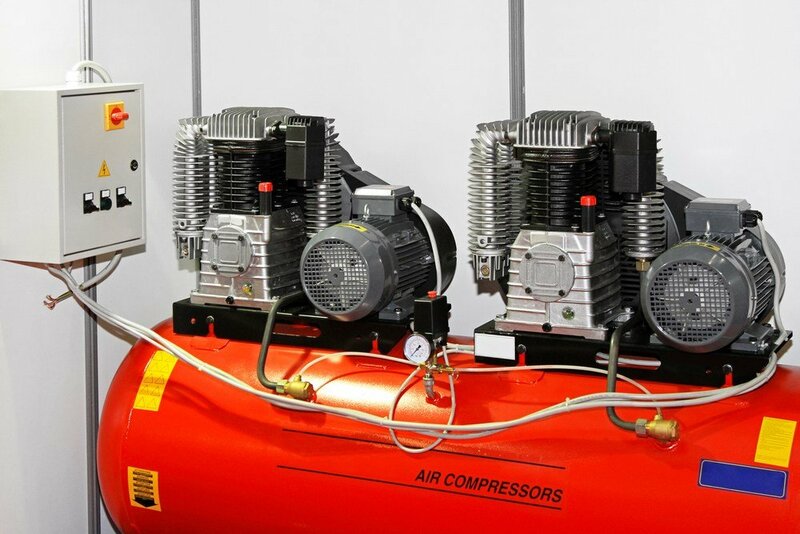 Which is the right size air compressor for your needs? At Tool Tally, I would like to just give you a specific answer, there are too many factors that come into play. I’m going to cover the specifications you need to know to determine air compressor size, and then provide a handy sizing chart to help you get your answer quickly. When discussing pneumatic tools you’ll inevitably hear the terms “CFM” (sometimes “SCFM”) and “PSI” mentioned. CFM (Cubic Feet per Minute) and SCFM (Standard Cubic Feet per Minute) are the terms used to measure airflow, or the rate at which a tool needs air delivered to it to operate properly. The key difference between the two terms is that SCFM is calculated using standard factors for pressure and temperature (both factors affect air density). CFM is derived using actual conditions of the environment. SCFM makes it easier to match cfm requirements by using the “apples to apples” approach.Most manufacturers will measure their cubic feet per minute flows in a standardized environment, so when you see a CFM rating on an air tool or compressor, assume it is SCFM. PSI refers to Pounds per Square Inch. It is the unit typically used to measure air pressure, or how much force a given air flow has. Both CFM/SCFM and PSI are important to having your air tools work at peak capability, as they are rated to work the best under given ranges for each measurement. Most tools will have a CFM and PSI requirement. You can check your tool for that exact amount. However, here are some of the well-known air compressor size requirements based on your tool type. Where Will Your Use It? Are you looking to do some handyman work around the house, or are you setting up your own shop in your garage or pole barn? Smaller jobs inside your home would benefit from a small portable unit, while the more demanding needs of a shop would need a larger compressor that can manage several types of tools and has the capacity for tasks that may require more torque and power from your tools. This simply means “will your tool be on all of the time”. A good way to look at it is a nail gun vs. a sandblaster. The nail gun is used in short bursts where the compressor can have time to replenish the air supply. Using a sandblaster means a constant air supply is required while the tool is in use, therefore needing more air capacity for proper operation. Most air compressors are oil-free. This means that they do not need oil added to them. These oil-free compressors are designed to take frequent breaks to cool down. Continuous duty compressor pumps require a little bit of oil to keep their pistons moving freely. They have the ability to run for long stretches without stopping. Depending on where you plan on using the compressor, the power source that you will have available in a particular environment is critical. Indoor applications are almost exclusively handled with electric compressors. Gas compressors are the perfect solution for outside work where there are no readily available electrical outlets. Besides…running a gas engine in an enclosed area is an extremely dangerous thing to do! The engine will emit dangerous combustion fumes that can be deadly (such as carbon dioxide). This is more a function of the overall design of the air compressor instead of relating to the size and capacity needed. Traditionally air compressors tend to be fairly loud. Newer designs take this into account in order to reduce the noise levels. This is much better for indoor uses where you may have to have conversations with others in the room. Why tank size matters, and what size do you need? Tank size is critical in order to keep the air supply at the right levels when you are operating a tool (or multiple tools, if you are in an environment where people are using more than one air tool at a time with a single compressed air source). Essentially all of the air to power your tools comes from what is stored in the tank. If you are using a tool that has a large air capacity, then a smaller tank size will not give you enough reserve air at the right CFM and PSI to keep the tool functioning as it should. Another way to look at it is to consider whether or not your tools will be continuous duty. That requires more airflow, therefore a bigger tank can store a larger volume of air (industrial compressors can have air tanks as big as 60 gallons or more). In contrast, using a small finish nailer to do some trim work in your basement would probably suffice with, for example, a small three-gallon tank. Pancake – Pancake tanks are typically found on smaller (3 to 6 gallon) portable compressors. The compact design helps with portability in a smaller package. Pontoon – This style is another common portable compressor design. It has a horizontal cylinder that looks similar to the pontoons on a pontoon boat. They are mounted horizontally and are also used in compressors with smaller capacities. Twin Stack – Same as a pontoon tank, but there are two of them as the name implies. This style is used to increase capacity in a compact space on portable compressors. Wheelbarrow – Some larger compressors have a larger pontoon style, but due to the weight of the tank and the other compressor components (such as the motor), they come with wheels and handles to help with moving them around the shop. You may find some twin-stack designs in a wheelbarrow configuration as well. Vertical – Take a large pontoon style tank and tip it on its end. This is the configuration that is used mostly for larger tanks that are meant to be permanently mounted in one place. As far as compressor capability and is concerned the tank style really doesn’t mean much – air storage space is air storage space, no matter what it looks like. Accordingly, capacity isn’t a function of tanks style but is directly related to the tank size. The different compressor tank designs are in place for the purposes of potential portability, available floor space for installation, and the overall size of the compressor. Do you need a gas or electric compressor? There are two main types of power sources for air compressors: gas and electric. Gas units are similar to power generators in that they have a small combustion engine that drives the compressor motor. Electric units are designed to plug into a standard wall outlet or, for larger units, hard-wired for bigger units with larger voltage requirements (from 120VDC up to 480 VDC). What is the difference between single and two-stage compressors? During your search for the right air compressor, you may run across single and two-stage compressors. What is the difference, and which is best? Single stage compressors pump the air up to pressure directly into the holding tank. With a two-stage model, the air will get pumped twice before being stored. The main result of this difference is that a two-stage compressor will be able to provide larger CFM and PSI ratings as compared to a single stage unit – and that can be critical in larger applications with multiple tools (such as an auto repair shop). If you take a little time to look at the differences between using air tools vs. electric ones, you’ll find that there are several compelling reasons to go the air tool route. The initial purchase price for an air tool is typically less than that for a comparable electric model. While true for the most part, that does have to be tempered with the fact that with pneumatic tools you need to also invest in an air compressor. That will make the total upfront costs more expensive, but it may balance out over time. Air tools also have the capability to deliver more power. Electric tools (particularly cordless ones) present the possibility of running out of power due to the batteries draining as they are being used. You don’t want to be in the middle of a job and then not have enough juice to get the job done. Electric tools may weigh more than air tools do. This may be a factor with- again – cordless electric tools as the weight of the battery needs to be factored in. Finding the right air compressor for your needs isn’t as mysterious or complicated as it may seem. All you really need to do is consider your usage plans in addition to the air requirement ratings for the tools that you plan to use. Take all of those factors into account (plus all of the other points that we discussed) and getting the best air compressor should be a fairly simple thing to do.